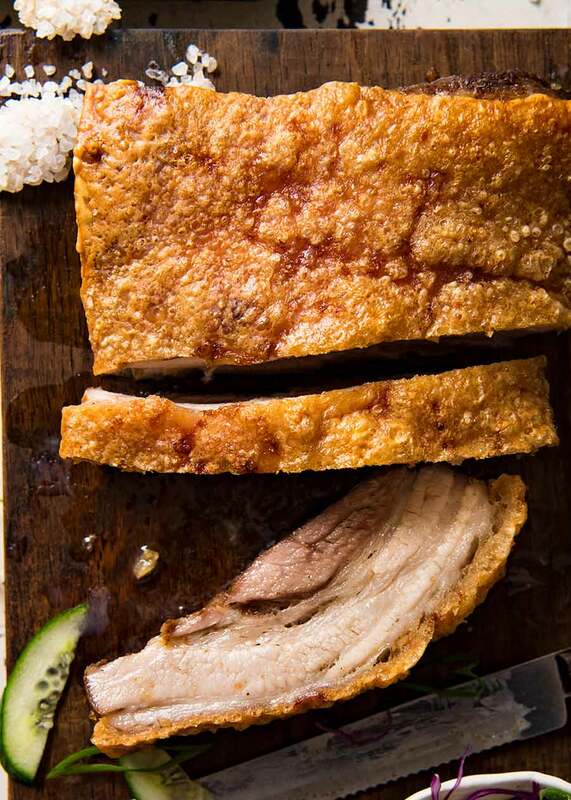 This is a Crispy Pork Belly recipe, just like you get from the Chinese BBQ meat shop! The best crackling in the world with juicy seasoned flesh, no one does crispy pork belly like the Chinese. In my humble opinion, the Chinese are the undisputed king of two things: crispy duck and crispy pork belly. It’s unlikely that I will ever share a proper Peking Duck recipe because it’s too hard to make properly in an ordinary home kitchen. Pork belly, on the other hand, is totally doable. That juicy, seasoned flesh. But mostly, it’s all about…..
Chinese pork belly crackling is, in my humble opinion, the best crackling in the world. 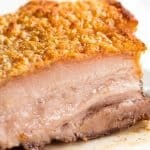 With the signature puffy bubbles all over, this Pork Belly Crackling is crispy and crumbly in a way that you will never achieve on a pork roast, even pulling out all the secret crackling tips. That’s what makes Chinese Crispy Pork Belly so sought after. The reason why the best Chinese BBQ meat shops have queues around the block on weekends. And today, my friends, you’re going to see how easy it is to make your own Chinese pork belly that comes out looking just like this ↓↓↓. 1. Pricking lots of holes in the skin = puffy crackling with bubbles. This is what makes all the difference, yielding that beautiful bubbly crackling that is so unique to Chinese pork belly. The Chinese have a special tool that they use to prick the skin. Me, I have my Basic Instinct moment and use an ice pick. It works remarkably well. But anything that is pointy and sharp will work just fine – for example, metal skewers. And yes, if you find it all too hard, you can skip this pricking step. More on that below in the Easy Non Pricking Method. * I credit them for this genius discovery, but I’m not actually sure if they discovered it! 2. Roast covered in rock salt = crispy crackling. Salt draws moisture to the surface, helping to guarantee you’ll get crispy crackling every single time. And yes, it works whether you do the pricking or not. Again, more on that below. Rock salt is easy to remove and also will not penetrate into the holes while roasting, making the pork far too salty. The pork belly is first roasted with the salt crust, then the salt crust is removed. At this stage, the skin is rubbery and looks thoroughly unappetising (step 7 above). All it takes to transform the ugly ducking into a crispy golden swan is to stick it under the grill/broiler for 25 minutes. Watch in amazement as it starts to puff and crackle and becomes soo crispy!!! 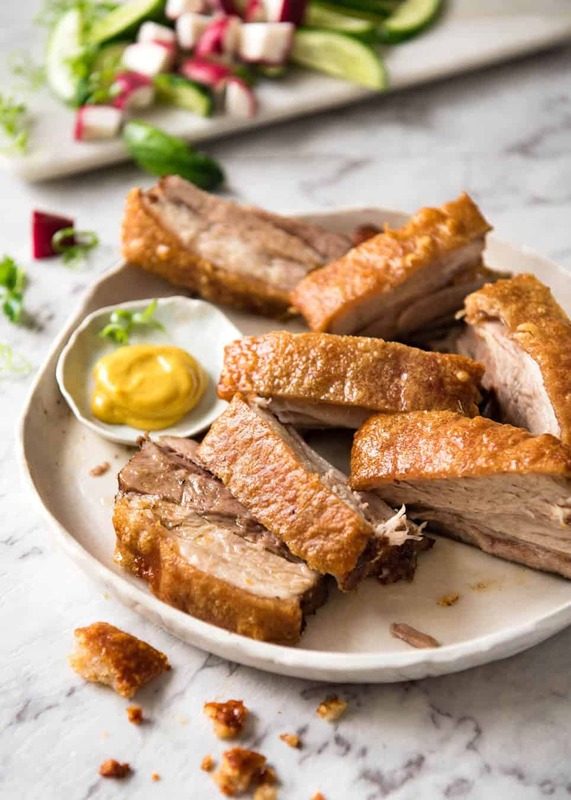 The pork flesh is infused with subtle flavour by marinating it in classic Chinese flavours – Chinese cooking wine (or dry sherry or even Mirin), five spice powder, salt and white pepper. There are some Chinese pork belly recipes “out there” that don’t marinate, but I really think it’s worth the time to do this otherwise the flesh somewhat lacks Chinese flavour (in my humble opinion). 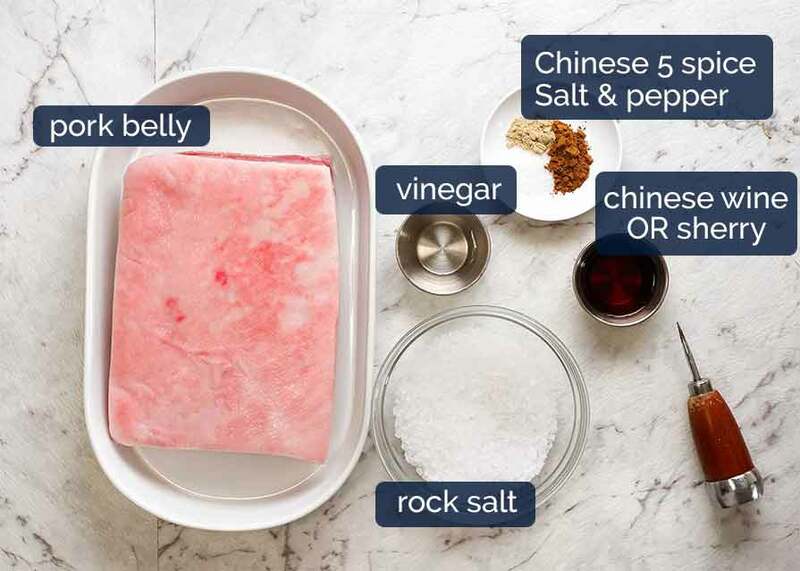 If you don’t have something suitable for or are having troubles pricking the skin, don’t be sad, there is another way to Chinese Crispy Pork Belly heaven! 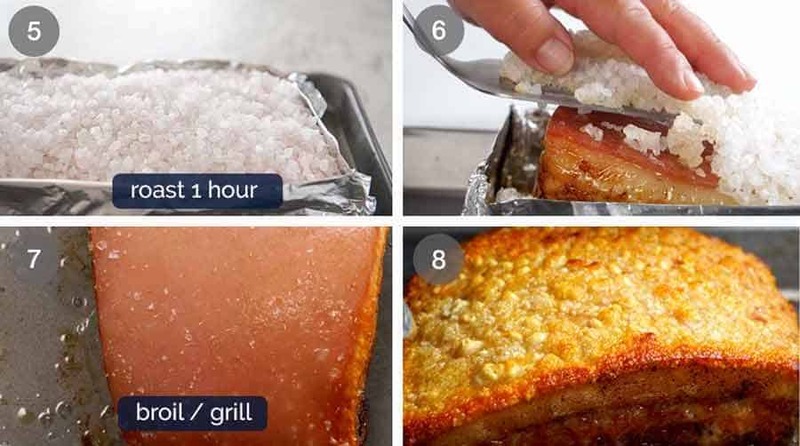 With this alternative method which is virtually foolproof, you can skip pricking the skin and the crackling will still be outrageously crispy, however, it will not have the signature puffy bubbles that Chinese Pork Belly is known for. When you break the crackling, it will snap cleanly rather than partially crumbling which the puffy crackling does (which you can see in the video). The reason this method is foolproof is because with the traditional Chinese method, if you are too enthusiastic with the pricking and pierce too far into the fat (or even worse, into the flesh), the juices will bubble up onto the skin, and the wetness as the skin is being grilled/broiled will cause little splotches where the skin is not super crispy. Doesn’t the crackling using this simple Alternative Method look almost impossibly perfect?? Check out that colour! This is the typical way to serve it: cut into slices, then each slice cut into smaller pieces. Small pieces is the go here because pork belly is rich! As for sauce, Chinese pork belly is typically served with mustard. Either your everyday yellow mustard or Hot English Mustard which is my favourite. The kick of fresh heat pairs so well with the richness of the pork belly! I’ve also had it served with white sugar. Just a small dish of everyday white sugar that you dip the pork into. It’s really good. As for sides, because pork belly is rich, I just serve it with plain fresh vegetables. My favourite is cucumber and radish because they’re so fresh and radish also has a kick of spiciness. Plus, they add great colour to the plate, don’t you think? I realise there’s a lot of information in the above, so I though it would be useful to finish with a summary. 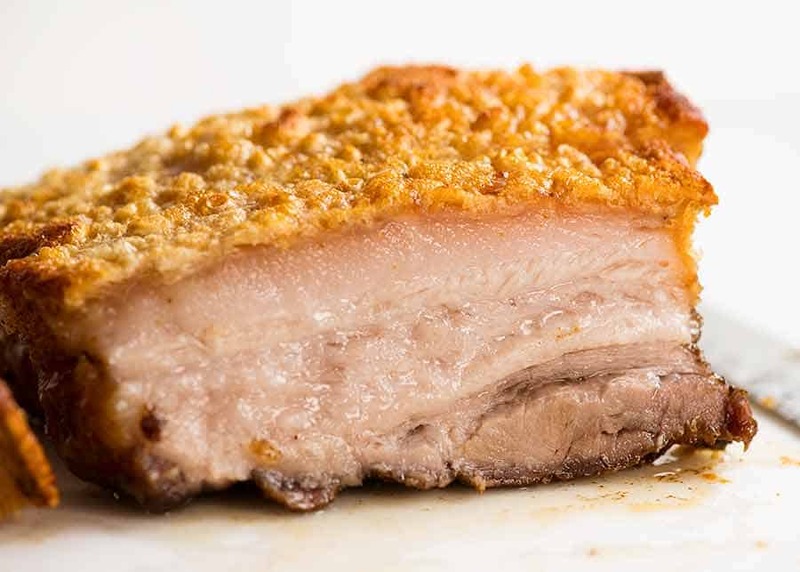 Traditional Chinese Crispy Pork Belly has a golden puffy crispy crackling that almost crumbles when you bite into it. It’s complete and utter bliss to experience! To make puffy crackling, you need to prick lots and lots of little holes in the skin. If you accidentally prick too far into the fat under the skin, or even worse, the flesh, this may cause juices to bubble to the surface which may result in some splotches that are not 100% crisp. The Chinese have a special tool to do this. I use an ice pick (aka my Basic Instinct moment ). The Alternative Easy Non Pricking Method yields a crackling that is a beautiful golden brown that is outrageously crispy but without bubbly crackling. 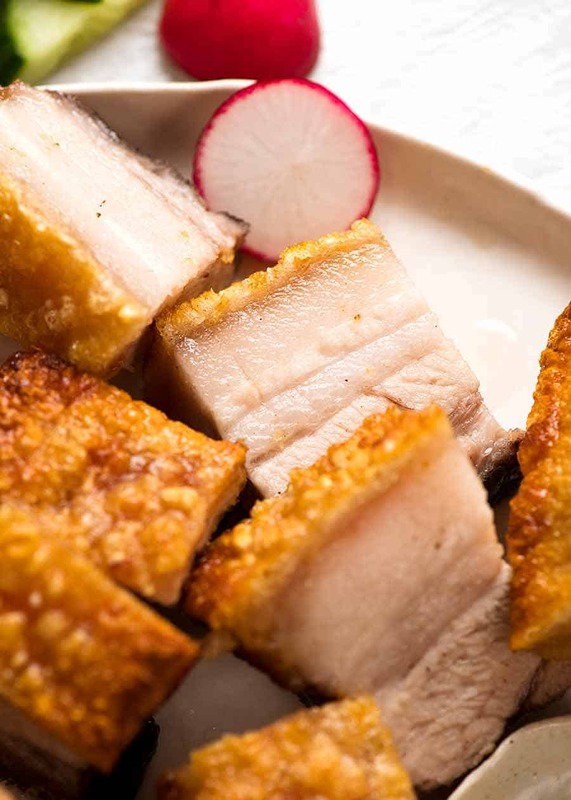 The crackling snaps rather than crumbles like the authentic Crispy Chinese Pork Belly. It is still a stunning crackling that many people dream of. 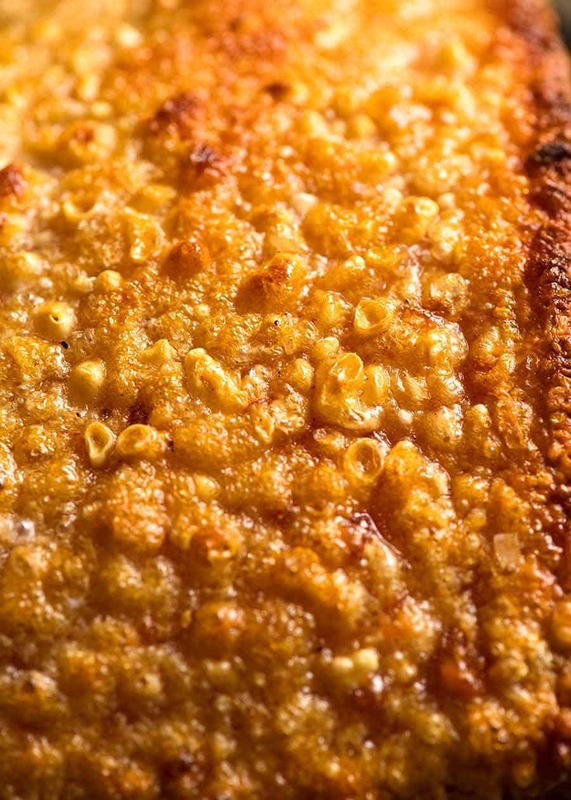 This method is very easy with guaranteed crispy crackling, every single time. DO NOT SKIP THE VIDEO!! Just wait until you hear how crispy that crackling is!! PS Oh wait, it’s also for Chinese New Year which is tomorrow! Celebrate Chinese New Year with the best of Chinese food! Chinese BBQ Pork (Char Siu) – just like you get from Chinese BBQ meat shops! Don’t watch this on Mute…. you want to hear how crispy that crackling is!! Turn the pork belly upside down. Rub the flesh (not skin) with Chinese cooking wine, dribbling it on gradually. Sprinkle over five spice powder, salt and pepper. Rub all over flesh, including sides (not on skin). Turn skin side up and place in a container. Dab skin dry with paper towels. Refrigerate uncovered for 12 hours (max 24 hrs, min 3 hrs). Remove pork from fridge. Place onto a large sheet of foil. Fold up sides of foil around the pork to enclose it snugly (see photos in post or video) with a 1.5cm / 2/5″ rim above the pork skin (to hold salt in). Transfer pork to baking tray. Dab skin with paper towels. Spread rock salt on the skin (the foil edges will stop it from falling down the sides). Remove pork from oven and transfer onto work surface. Switch to grill/broiler on medium high. Move shelf so it is at least 25cm/10″ from the heat source. Fold down foil and scrape all the salt off the top and sides. Return pork only (i.e. discard foil) to baking tray. 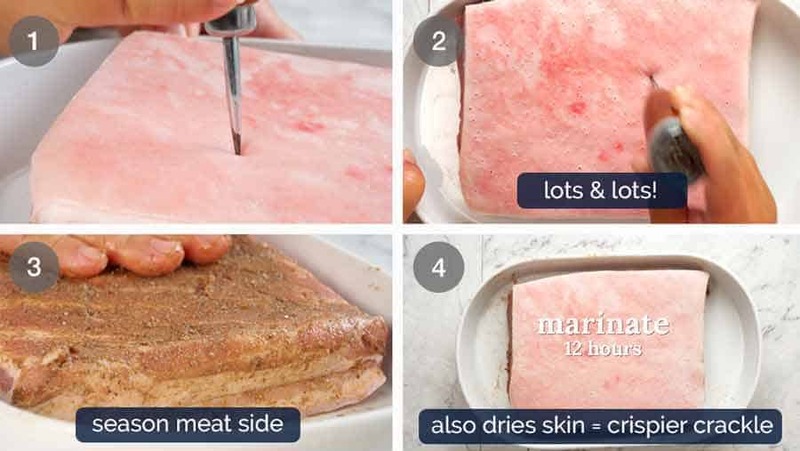 Remove pork onto cutting board. Slice into 1 – 1.5cm / 2/5 – 3/5″ thick slices, then into smaller slices like pictured in post. Serve with ordinary yellow mustard – or Hot English Mustard if you like spicy like me! Not Dijon, just ordinary American or other yellow mustard (yes really!). Sometimes it is served with white sugar on the side too. Add some fresh raw vegetables (I use cucumber and radish). 1. 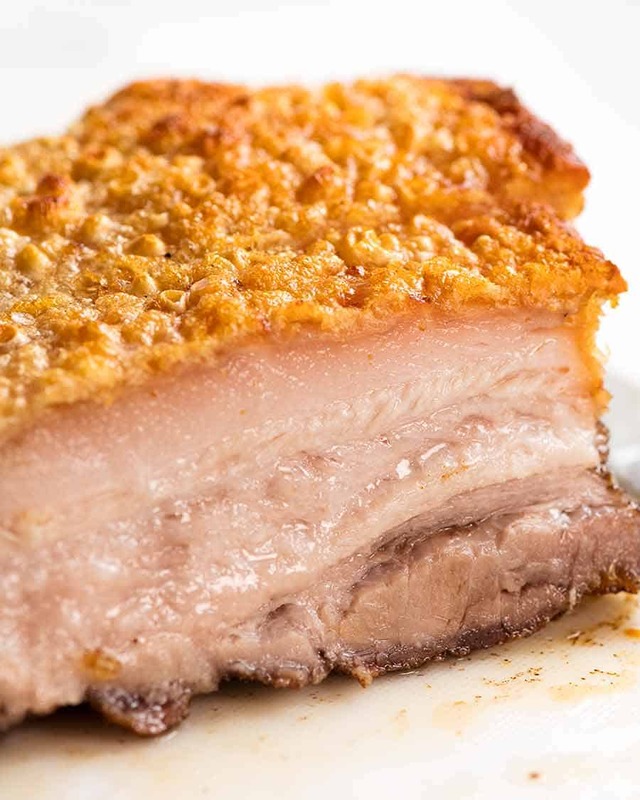 Pork belly – try to get one with even thickness, it will make the best evenly cooked crackling. Look for pork belly with lovely ribbons of fat streaking through it. 2. Chinese cooking wine (Shaoxing wine) – sub for dry sherry (near perfect) or Mirin (very good sub). If you can’t consume alcohol, just skip it and add an extra 1/4 tsp salt. Read here for more info. 3. Chinese Five Spice Powder – a spice mix used in Chinese cooking with 5 spices that’s widely available at everyday supermarkets. 4. Rock Salt is called for because it’s easy to remove and also the salt doesn’t slip down into the holes which would make the pork too salty. 5. Skin piercing – If you pierce the fat too much (a bit is ok) or flesh, then after you remove the salt crust and place it under the grill/broiler, juices will bubble up onto the skin and prevent the skin from getting crispy. It’s not the end of the world if you have a handful of pricks that went too deep, you will just get tiny splotches or little strips of crackling that’s not 100% crispy. 6. Broiling – Ensure the pork isn’t too close to the heat source. That’s the key to an even golden crackling, rather than burnt splotches here and there. The further away it is, the better! 7. Foolproof Easy Method – Use this if pricking is all too hard. 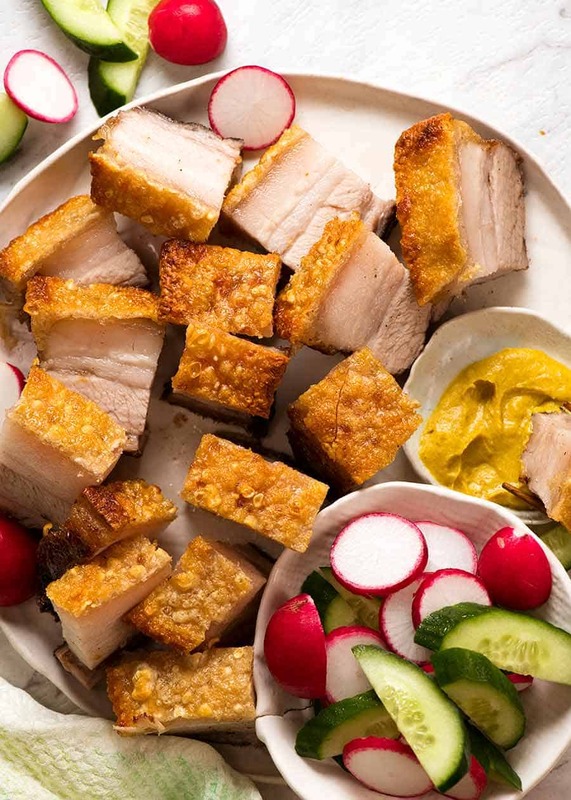 Makes super crispy crackling and the same juicy flesh, but without the bubbly crackling. It’s really really good and super easy. Read in post for more information. Follow recipe up to and including brushing with vinegar but do not prick skin. Cover skin with rock salt per recipe, OR use 1 cup kosher/cooking/table salt (enough to cover skin about 3 – 5 mm / 1/8 – 1/5″ thick). 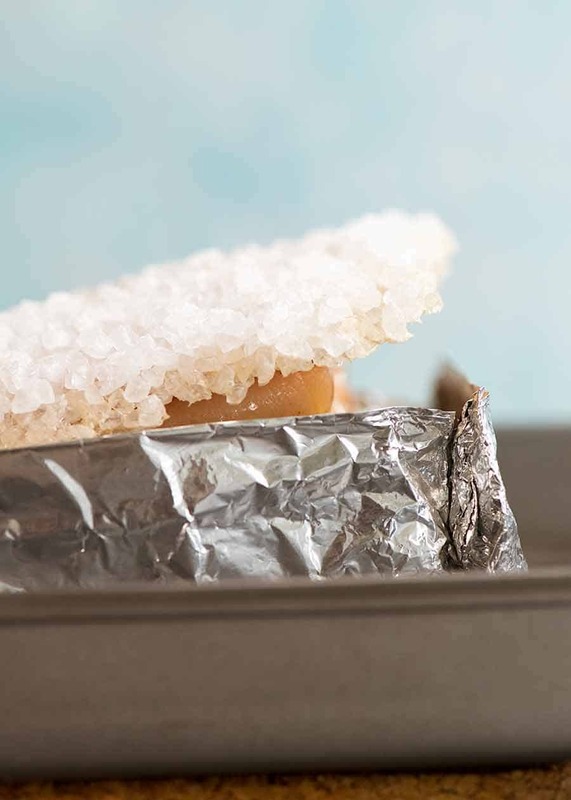 If you use fine grain salt, make sure the foil is VERY snug around the edges – if salt falls down the sides, it will make the flesh salty. Roast per recipe and scrape off salt. Instead of flicking to grill/broiler, turn the oven up to 240C/465F. For this method, oven works better to make skin crispy. Place pork on a rack and return to baking tray, roast for a further 30 minutes or until crackling is golden and crispy. 7. 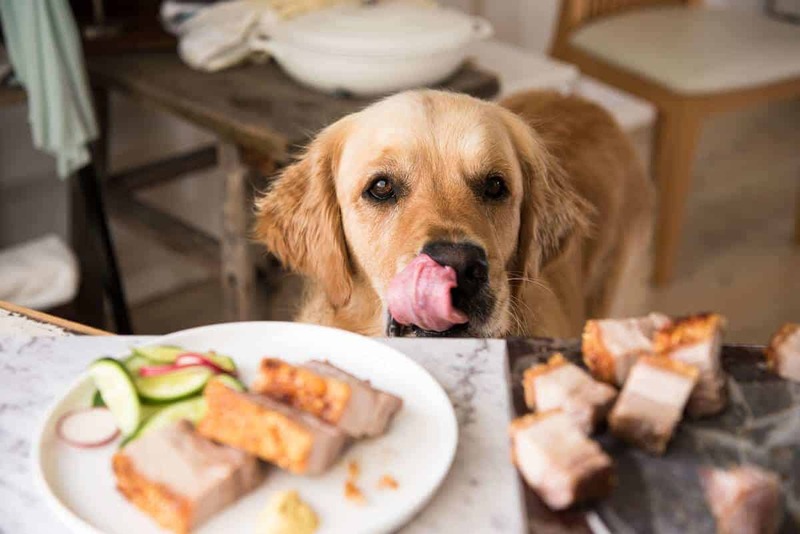 Servings – Pork belly is very rich so a 1 kg / 2 lb raw piece (shrinks to about 700g/1.4lb) serves 6 – 8 people as part of a multi course meal or as a starter. I don’t serve pork belly as a main because I find it too rich. In the photo pictured in the post with the slices, that is the sort of starter I would do. It’s plenty! 8. STORING / MAKE AHEAD: Cook per recipe, including crispy skin. Once cool enough to handle, separate crispy skin from meat. Cool, THEN cover and refrigerate separately – crackling stays crispy! Reheat meat in microwave and reheat crispy skin just until warmed in oven at 180C/350F (~ 5 minutes). Because crackling stays crispy even after refrigeration, reheating for the skin is JUST to reheat, not to crisp. Don’t take the skin too far in the oven, it starts to lose crispiness, believe it or not! 9. Recipe created / adapted from numerous sources over the years, including but not limited to: Woks of Life, Chinese Crispy Roasted Pork by Garden Time (this is my main reference point for the traditional method), and a Gordon Ramsay cooking show (can’t remember which one!). 8. Nutrition estimate, taking into account 1/3 cup of fat that is discarded from the foil. Originally published January 2017. Entire post refreshed, new photos added, brand new (much better!) video. No change to recipe, though writing was cleaned up a bit. I had many, many chances to catch this shot…. he was doing this the whole time I was shooting the pork belly!! The post Chinese Crispy Pork Belly appeared first on RecipeTin Eats.